Daily Illuminator: Praise For Dungeon Fantasy! March 19, 2018: Praise For Dungeon Fantasy! We've had an amazing response to the Dungeon Fantasy Roleplaying Game from fans and new players alike . . . so much so that the game sold out at our main warehouse. However, it's not on the short list for a reprint at this time, so you should look for your own copy at the local game store soon, before it's gone! Just Roll 3d6: This in-depth overview discusses the boxed set, from the books to the map itself. 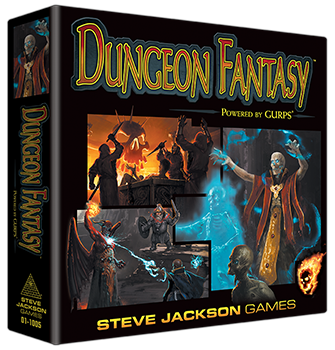 It's an honest look at what each component adds to the game, and ultimately determines that "DFPRG is clearly one of the best entry points to GURPS that SJ Games has produced yet." Octopus Carnival: This review compares it to other systems, and it comes out of the gauntlet favorably! EN World: Our friends at EN World are always looking at the hottest games in tabletop, and enjoyed delving into Dungeon Fantasy. Gaming With Swag: Brad gives a retrospective of growing up around RPGs, and praises the value of the boxed set!